It is with great shock, surprise and some pleasure that we get back from walking the dogs this morning to find someone removing our old bathroom from out of the front garden. A true sign of progress perhaps and now there’s no going back for the old bath. Bathexit now means Bathexit, as they say. I skip cycling due to the slight cough I have (wimp) but L does manage to get a swim in. Our builder has now decided that our long delayed toilet will not fit due to the pipework behind it. He has put a persuasive and believable case so I agree to an alternative model but it does seem somewhat convenient. It's a pity we didn't have someone come round and measure up beforehand. Oh, we did didn’t we Mr Builder? However while Toiletgate rumbles on we do at least have three and a bit walls tiled. Tonight’s its Booker Prize Night. L has a book club bash to debate it and pick their own winner then she rushes home for us to watch the grand unveiling on TV. 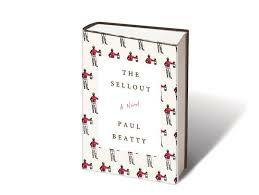 Congratulations to Paul Beatty for 'The Sellout'.